Do not miss the Good Karma Farm Scarf Contest. Win 8 skeins of superb 60/40 - Merino/Alpaca blend yarn! 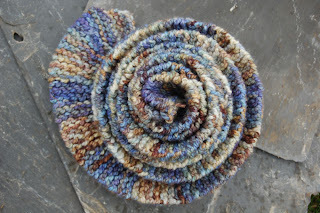 Good Karma Farm: The Nautilus Scarf: "This new colorway of yarn inspired me. It reminded me of our Belfast coastline - blue water and pebbles, bits of crumbled old sidewalk, and ... (Click for more)"